Ask anyone with more than one website and they’ll tell you, every website makes money differently. 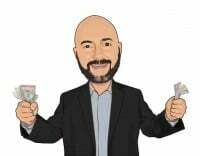 I make just under $7,000 a month across my five blogs and the YouTube channel but that overall number hides a big difference in income streams on the sites. My personal finance blog jumped to the top of Google for some strong personal loan keywords and the site makes lots of money for affiliate sales each month. The story for my crowdfunding blog was very much different. I struggled to make money on affiliates or advertising, there just aren’t that many ad buyers in the space. In fact, I almost gave up on the site when it didn’t look like it was going to make any money. Then I published a book based on what I had learned about raising money in the crowd. The book shot up to the top in several Amazon categories and I’ve made over $10,000 on it so far. My work on the site also landed my biggest freelance project yet, a long-term newsletter deal for $3,500 a month plus commission. It was another story entirely on a dating & relationships blog I bought early in the year. The previous owner had struggled to monetize the site and I hadn’t done much better. I boosted traffic by 400% over the six months after taking over but blogging income was only up to about $300 each month. That monthly revenue is just under half of what I paid for the site, not bad but not nearly what I think the website can make. I decided to try one more blogging trick, developing a few products that have worked on other websites. The product is called printables and it can be a great way to monetize traffic that isn’t making money on other income streams. Printables work amazingly well on craft and home-school blogs but can be used on just about any website to rocket your monthly income. After adding just three printables to the site, it’s one of the most profitable blogs I own and makes nearly a grand each month. Even better is that printables are a completely passive income source that you don’t need to manage each month. Printables started out just as the name implies. Craft blogs were offering a download of printable designs and patterns. With the massive success on craft and mommy blogs, printables have taken off and are inclusive of any kind of digital download. Purists will argue with me here and say there is a difference between printables and digital downloads but the similarities far outnumber the differences and the strategy to make money is the same. That means you can think of printables as anything shorter than a full-length ebook and delivered in a digital format over the internet. We’ll get into the creation process below but basically you are just writing something up in a document or in publisher software and then converting it to a pdf file format. Printables are usually very brief, from just one page and up to 20 or 30 pages. They involve more graphic work compared to ebooks. Whereas ebooks are generally just text, printables offer eye-appeal with more image overlays and graphic formatting. Printables are detailed and to the point compared to longer content products but cover much more than just a simple blog post. Often, printables offer a how-to approach to a very niche topic. How do Printables Make Money? Printables are sold directly on your website, you control the pricing and collect all the profit. That’s a nice change from selling products on other platforms like through Amazon where you may only get 30% of the sales price. 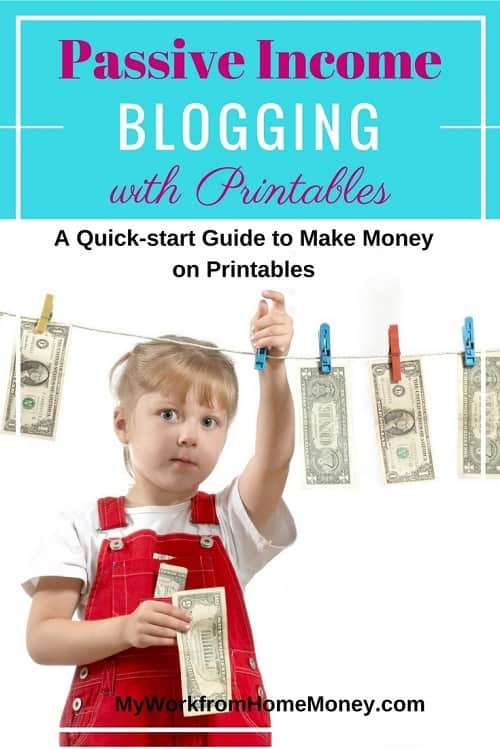 To make money on printables, you simply create an account with payment software (more on this below) and set up the links on your blog. Once it’s set up, a printable is completely passive income. A visitor clicks on the link, pays for the product and is automatically sent a link to the downloadable printable. Printables are much easier and faster to create than a full-length ebook. They are also very flexible and targeted. Since you can put together a printable quickly, you can design many for very specific topics and place them strategically on your website. One of the strategies we’ll talk about below is creating a printable for a specific post. If one of your popular posts isn’t making money like it should, you can quickly create a printable with more detailed information and sell it in the post. That’s super-targeting since you know people coming to that post through Google search are going to be looking for exactly that kind of information. Besides a great way to monetize your blog, this is also a favorite strategy for growing your email list. Instead of selling a printable, you can offer it as a lead magnet to get people on your list. Since the printable is hyper-focused on the specific post, conversion rates are much better compared to a generic lead magnet for the whole site. Since printables are generally low-cost products, you don’t need the sales funnel you might need to sell higher-price products. We put together a strategy for making WTF money with webinars and $1,000 courses last week in a very detailed sales process. By comparison, you can usually sell printables with a one or two-paragraph lead and some bullet points before offering your buy button or link. The creation process and pricing for printables is a lot like publishing a book though there are design differences. 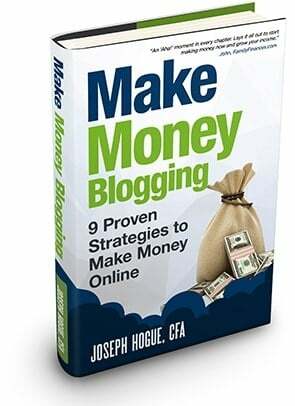 Like most of the ways to make money blogging, there’s no one process you must follow but this one has worked for me. I’d love to hear any of your ideas on putting together a great printable that makes money. There are two ways I like to get ideas for printables. The first is just to look at the basic topic for a blog and then narrow it down. Printables need to be very detailed but brief so you’ll need a very specific idea or need to satisfy. You’re not going to do a printable on ‘personal finance’ but you might put one together on ‘paying off your debt using a specific process’. 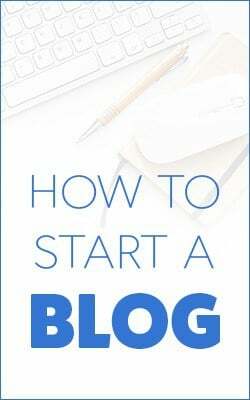 This kind of printable is going to make money on your site because it relates to the larger theme and will interest a lot of the people that read your blog. Another great way to get printable ideas is through your top-performing posts. Some of the most popular posts on my blogs just don’t make much money. They get thousands of visitors a month from Google search but there aren’t many related affiliates or other things I can promote. The best way to make money off these articles is to create a printable around the post topic. It needs to be some need or question left unanswered by the post, something else within the topic that people need. Try finding one or two tasks that people need to do within the larger topic and create a printable around how to do those tasks as quickly and easily as possible. One easy way to find topic ideas for your printable is to do a Google search for the keywords bringing people to your article. Most searches will show a box with additional questions people have when searching for that topic, i.e. “People Also Asked”. Use these questions as printable ideas to answer secondary questions from visitors. Brief doesn’t mean low-quality or of little value. You’re saving a ton of time making a printable rather than a full-length book so use some of that extra time to put a lot of detail into the printable. Go through a couple of revisions where you ask a friend to review it and revise with their feedback. You want your printables to be high quality and visually appealing. Since the price point is low compared to other products, a lot of your readers will buy multiple printables if they are happy with the first. On design, use lots of white-space in your printables. You want to include call-out boxes, those bordered boxes of text on the side of the page. You also want to border text boxes in things like thought bubbles and speech bubbles. Your printable shouldn’t look like an ordinary book but more like a quality brochure. Add background images behind some of the text and fade the image so the content stands out. If you’re not design-minded, you can find someone on Fiverr to help design your printable. Most Fiverr projects start at $5 but you may have to pay more for the whole project. I suggest hiring a couple different people for smaller design projects to find one you really like then hire them to do your printable design work. You will also want two banner images to promote your printable. The best banner image sizes are 300×250 pixels and 728×90 which can fit in your blog header, in posts and in the sidebar. Check out banners used by other advertisers for ideas but it should include your cover image and some persuasive text at minimum. Make more money by making your printable over ten pages. Most printables are shorter than this but create one a little longer and you can upload it as an ebook on Amazon Kindle. You won’t want to price it as high as your larger ebooks but you can still make a lot of sales at the $0.99 to $2.99 price point. For the Kindle version, you’ll need to format it more like a book without the callout boxes and graphic design. Make sure you proof read and edit your printables just as you would a longer book. Ask at least one other person to read through the final draft for readability and grammar mistakes. One or two mistakes may not stand out in a 150-page book but they sure will in a 10-page printable. Converting from a text document to the pdf format is easy. 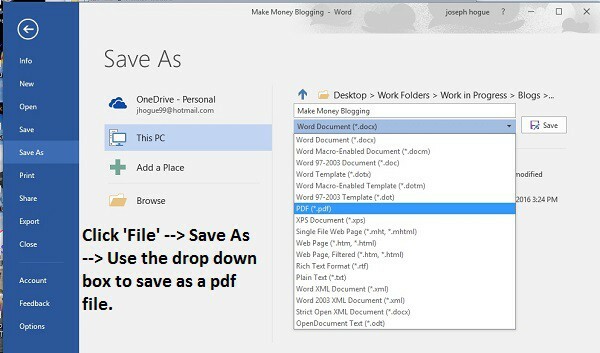 Click on ‘File’ and then ‘Save As’ just like you would to save your work. Then use the drop down box to change the format to a pdf. Your document will be saved and you can open it up as a pdf with Adobe Acrobat. To publish on Kindle, you can use the Word document, pdf, EPUB or MOBI file formats. I know bloggers that use Microsoft Publisher or other publishing software to create their printables. I’ve used publisher before to do my own graphic design but I now just put the whole thing together in a word document and have a freelancer from Fiverr do the graphic design. Creating your printable first in a word document gives you the flexibility to turn it into a Kindle book as well as other formats. The biggest mistake in pricing your printable isn’t setting it too high but setting the price too low and missing out on making as much money as you could otherwise. Pricing your printable too low not only means missing out on more money but could mean losing out on sales altogether if people associate the low-price with low-quality. Check other blogs and books in the topic on Kindle for how other people are pricing their short books. Scrolling down to the specifications section on an Amazon page will show you an estimate of the page length. A recent Smashwords survey on ebook prices is also very helpful for printables pricing. 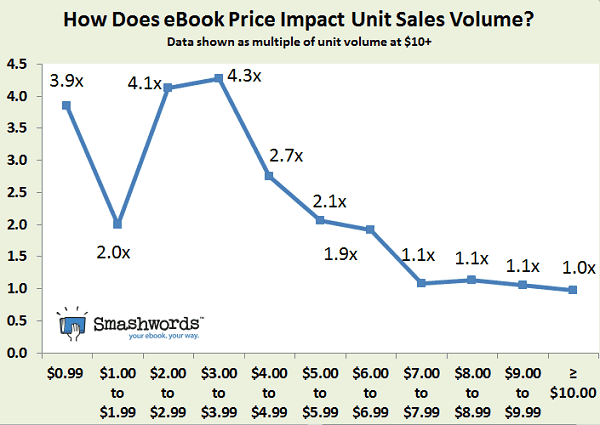 The graph shows the number of books sold at each price point compared to a $10 book price. For example, books priced at $0.99 tended to sell 3.9-times as many copies as those priced at ten dollars. So there’s an obvious tradeoff between selling more copies and making money on higher prices. You may sell nearly four-times as many copies at the $0.99 price but you still won’t make much money. 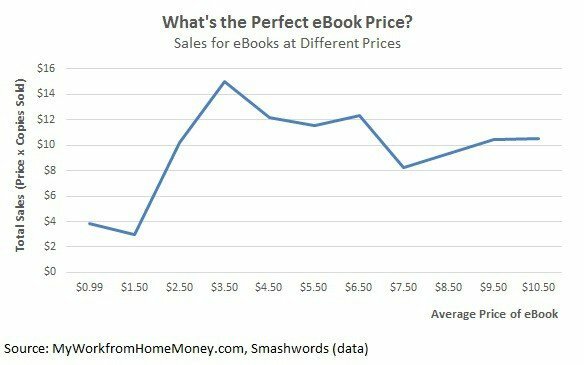 I’ve converted the Smashwords survey into a total sales graph to show how much money you might make at different price points for your printable or ebook. Note that this is total sales on a relative basis. It shows, according to the survey data, that if you sold one copy at $10.50 then you might be able to sell 4.3 copies at the $3 to $3.99 price range and make more money. The sweet spot for printable and ebook pricing seems to be between $2.99 and $6.99 which is exactly what I’ve found in my experience. Also note that this doesn’t account for fees paid when you sell your printable or Kindle book. You’ll generally pay around a 3% processing fee plus a monthly charge to use payment software on your blog and sell your printable. Amazon charges 70% of the sales price for books priced under $2.99 or 30% of the price for books $2.99 or more. There are two main ways to sell printables on your blog to make money. The first is through your own SSL certificate, a PayPal account and a payment gateway tool. Before all-in-one shopping cart providers became popular, you would need to do everything yourself. This meant applying for an SSL certificate to secure the back and forth communication between your blog and a customer. Then you would integrate a payment gateway tool and a payment processor like PayPal onto your blog. You can still do all this but it’s really not worth it and isn’t going to save you any money. The easier solution to make money selling printables directly on your blog is through an all-in-one shopping cart provider like Shopify. After creating an account on Shopify, you download the Shopify plugin to your blog and connect it with your store name on the account. You first add a product with a title, description and price as well as any images. You then link your PayPal account through the email you used to open your Shopify account to receive payments when a product is sold. Once you’ve added the Shopify plugin, you will see an ‘Add Product’ button when you are in your WordPress editor. This will allow you to add your clickable product image into a post or just add a buy button. Shopify charges $9 a month for the Lite version which is all you need to sell on your own blog. If you haven’t got a blog yet, you can open a full store and website through Shopify for $29 a month. 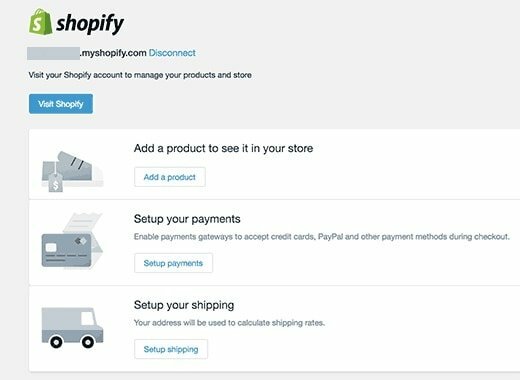 Shopify charges $0.30 plus 2.9% of each sale and customers can pay through credit cards or PayPal. You can also accept payments in person through the Shopify app and pay only 2.7% with no transaction fee. Other digital sales services websites include SendOwl, e-junkie and Gumroad. They all work identically to Shopify and the setup process is the same. Gumroad can accept credit card payments directly, meaning you skip the PayPal processing fee on your sales. Gumroad is also available in some of the countries PayPal is not accepted. There is no monthly fee but you pay 5% of the price plus a $0.25 commission on each sale. SendOwl can stamp the customer’s name and e-mail on your pdf files whenever they go out, making it less likely anyone will upload your files on the internet for free. The website is best for people that sell in high quantity. There is no per-sale commission but the site charges $6 to $39 per month. E-Junkie is one of the most popular shopping cart websites because it charges no transaction fees and is easy to use. You pay depending on the number of products you have available starting from $5 a month for 10 products and storage space of 200 MB. Even with larger ebooks, you shouldn’t have a problem with the storage space limit. Once you’ve got your store set up to start selling your products and printables, it’s time to get them on your blog. 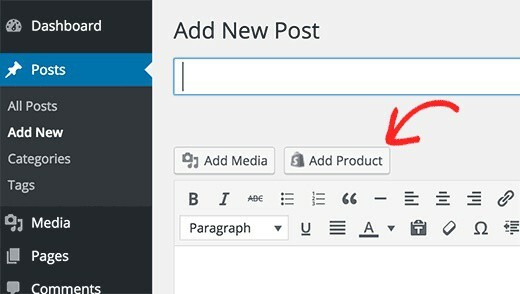 Update any relevant posts with a paragraph and bullet points about the product along with a link. This is great for printables that are directly related to a specific post or page on your site. Create a landing page for each printable. This is a separate page, usually set up on special software like OptimizePress or LeadPages. A landing page is important because it doesn’t include your blog sidebar or any of the other options that can distract a visitor. It is just a sales page targeted at one product. Include all your products and printables on one products landing page like this one. This gives you one page to highlight all your products with links or buy buttons to your shopping cart. You can also sell your printables on Etsy, a marketplace site aimed to crafts and DIY ideas. Selling on your Etsy store costs $0.20 for each four-month listing plus a 3.5% transaction fee on top of PayPal fees. The site doesn’t get as much natural traffic as Amazon so you will have to promote your own products. Some bloggers promote their printables on their blog and then just link to their Etsy store. It works well and is a quick process but I like selling downloads directly from my website. It’s just one less click people have to go through to buy the product. Fiverr isn’t just for finding freelancers but can also be used to sell your own products. Since most gigs start at $5 each, it’s a perfect price point for selling your printables. Opening an account takes no time at all and you can link it to your PayPal account. Fiverr charges 20% of the selling price which is less than you’ll pay on Amazon. The downside is that Fiverr isn’t automated like other platforms. You will have to respond to sales and send the files yourself. Go further with Fiverr and add ‘gig extras’ which are just product upsells like different services or offers. It’s a great way to pull people in for the $5 price and then make a little more money. Paid advertising doesn’t normally make much sense for printables. You are probably going to convert less than 2.5% of the visitors to a page into a sale. That means at least 40 visitors for each sale. If you price your printables around $4 each then the max you can pay for advertising would be $0.10 per visitor ($4 divided by 40). That’s tough to do when advertising on Facebook, Google or just about any other website. That’s assuming all the visitors to a post even scroll down to see your product. I would say a more realistic average is about 1% of visitors will buy a product which means you need 100 visitors for each sale. That makes your organic (natural) promotion all the more important. If you are using a social media management tool like HootSuite, you can schedule to share the posts featuring your products repeatedly. Don’t overload your followers with these but I would share a product-related post at least once a day on Twitter and once a week on Facebook. Don’t forget to share on LinkedIn, GooglePlus, StumbleUpon and all the other social networks. Not only might it lead to a sale but it is also going to bring more people to your blog to become email subscribers and regular readers. If your product-related posts are not already bringing in a lot of Google search traffic, spend some time updating them with content and images. Any improvement you can make in search traffic is free advertising for your products. Check out this republishing method I used to triple the traffic to my blog posts. You can also use your printables as add-on incentives to sell higher value courses and other products. I usually try to avoid giving away products for free but it’s a great strategy to get that sell on a bigger product. If you are also selling through Amazon or Etsy, reach out to readers for reviews on the sites. You don’t need to have bought the product to leave a review on Amazon and it’s great for building that social proof that leads to more sales. The easiest way to make money with printables is with higher search traffic from Google. You do this by targeting keywords around your printable idea to get consistent monthly visitors from search. The best part about making money with printables is that it is one of the best passive income streams you’ll find. Once you have a printable created and linked on your blog, you won’t have to do anything to make money. A reader buys the product and the shopping cart system sends it automatically for real passive income. It’s a great way to monetize sites that aren’t making money with larger products like affiliates or courses. Your contact us page is not working. I’d like to feature this post on profiting online with printables. Hi Ike, I can be reached by email at jhogue at the domain email. Thanks for reaching out. I love printables as a revenue source, so easy to put together and a great form of passive income for a website. I really like what you’ve suggested here for selling printable and generating passive income for it. I’ve had my website for 3 years and made nothing but then again I haven’t done much with it either. I just recently started posting regularly and added some free printable. It’s all DIY and early child development like free learning worksheets. I’m currently working on my first collection if printable to sell you thus information is gold to me. Would love to hear how it works out for you Alice! I love printables. 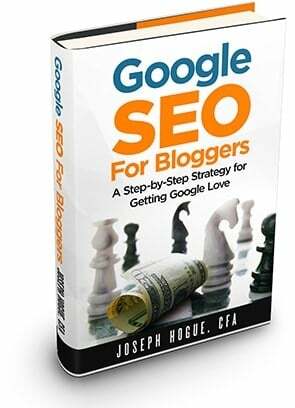 So much easier than a full ebook but make lots of money because they are super-targeted to each blog post. Hi Nikki. Always glad to help. I don’t have much experience in the travel space but printables can work in any niche. Just off the top of my head, I think printables on…packing checklist, best places to see in each city, biggest dangers/places to avoid in each city…could be popular. Using the printables as lead magnets is a good strategy but consider having a tripwire (redirecting to a page after signup that upsells into a book or other product) to make a little money.